Thank you to my niece, Katie, for making this. Its hard to believe that tomorrow is the start of a new month, October of 2012, which means today is the end of September. September is "Childhood Cancer Awareness Month, Spread the Gold". Today I was driving in my car and looked in the rear view mirror where I wrote in GOLD about emilyhubbel.com to spread the awareness. What surprised me the most is no one asked about it, no one asked who Emily is, not one person. I guess it surprised me that no one said anything, because I wonder if people are making themselves aware. So, today I wrote on the bottom of the back window, "Are You Aware?" And if anyone asks, we have business cards for emilyhubbel.com, to spread the awareness. While today may be the end of September, it doesn't mean that we are done spreading the awareness about childhood cancer, about Emily and about the other kids who are fighting this nasty fight. We will continue to spread the awareness because it never stops for Emily who is fighting and all the other kids who are fighting. It Never STOPS! 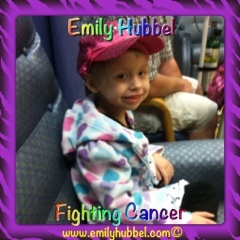 Tomorrow Emily has clinic for lab counts to see where here counts are. Hopefully she doesn't need any transfusions and hopefully her counts are on the up and up and she will be back in school by mid week. Emily has a cough right now, which at first she only had at night when she was sleeping, but she has it during the day now, so hopefully its just a cough and nothing else. We still haven't had an update on what is going to be covered with the shots that Emily will need for antibodies, so we hope that everything will work out and we won't need to pay out of pocket. I know that we needed to send a copy of our prescription card over to have them review it through there, but we haven't had any update since then. We also are not sure when antibodies will start since we are waiting for the approval, so as soon as we know more about that, we will update you all about antibodies since we have had a lot of people asking questions about what it involves and why Emily needs it? Again as it appears we will be traveling to Michigan during the week of October 8th, we will probably be driving this time since we are still waiting on dates. The last email I had was from our nurse, Julie, from Helen DeVos who said they were working on dates, so we should be hearing soon. Things that continue to be helpful is gas gift cards for traveling, gift cards,and just cards for Emily. Emily loves to check her mail and see cards that people make her. She absolutely love cards, and she thanks everyone of you who sends her cards thinking of her, it puts a smile on her face. Today Emily received a card from Ashley's Special Cards and she loved the card all done up with Justin Bieber. It was really sweet. We will continue to keep you updated on how things are going. Keep spreading the awareness of childhood cancer and our children, and make sure you hug and kiss your kids and tell them how much you love them. 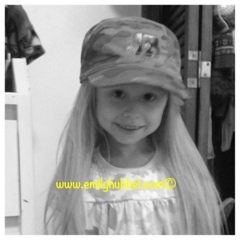 Emily wearing her wig that she received through VCU. Emily I like your lovely long hair but think you look lovely without it too. You know I pray for you many times a day? I think you are one amazing girl and your smile makes me smile even when I am blue.